Top lace closures are hair pieces that attached to the top of the head,lace closures are rarely seen or even noticed.As the name implied,top lace closures are used at the end of the weave-gluing process.They blur any apparent difference between a glue-in hairpiece and sew-in hair weave extensions.Lace closures are always placed at the crown of the head after hair weave wefts are glued-in for a uniform full head of hair look.The lace that top closure hair being attached to is flesh toned, giving the appearance of a natural growth of hair from the top of the scalp.Due to the infusion of weave hair with scalp hair required for sew-ins,separate lace closures are not necessary.Without top lace closures however, glued-in hair appears to sit on top of scalp hair for an incomplete hairstyle and won't be realistic. 1.Create a removable hair weave cap.Gluing weave wefts and lace closures onto a cap prevents the glue from pulling at your hair upon removal --and decreases the chances of skin allergic reactions. 2.Put a weave cap onto a wig head, so you can ensure that the hair weave is being glued-on evenly. As the hair is glued on the cap,it can appear on your head. 4.Apply the hair weave to the cap from left to right --beginning at the nape of the neck -- and move up.Cut off the ends of the hair that extend past the hairline,until you get to the level of the ears. 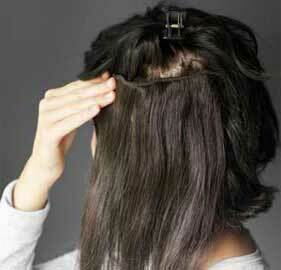 Layer the lace closure close together to prevent gaps between weaving hair. 5.Glue the hair weaves in a circular fashion from the left ear to the right ear around the forehead to the left temple.This will ensure a layer of hair that will be in front of the lace closure,so the lace closure hair will have some hair to blend into your own real hair at the front. 6.Glue subsequent top lace closure lace in a semi-circular fashion.Glue these hair up to the temple so the forehead hair does not appear too thick.Leave a circle about the size of your lace closure at the top of the cap bare area. 7.Squirt or drizzle a thin layer of glue to the bare circle at the top of your cap. Apply your lace closure.The closure hair will blend with the glued hair weave wefts for a natural looking appearance.